Have you ever wondered how so many of the opponents in your DraftKings contest knew to play the same guy, despite the fact that you've never heard of him before? Narrowing down the massive player pool DraftKings to provide an actual list of playable players is a great start to cure this and that's exactly what our DraftKings MLB Cheat Sheets do for you. We sort through all the players on any given slate and provide you with the players you need to know about, and more importantly, the ones you need to be inserting into your lineup. The clutter of hundreds of players, each with an insurmountable amount of statistical columns, goes away when you sign up for our daily fantasy baseball cheat sheets for DraftKings. We provide you only the players you need to know about and the statistics that really matter. The best part about all of this, is we provide it to you each and every day, right on the site or even directly to your inbox. Think of all the time this will save you. No more Googling “best daily fantasy picks" or “who are some good DraftKings outfielders", just sit back and enjoy your day while we do all of that work for you. We curate the content and information and display it to you in an easy-to-read format. Time is a very important factor when it comes to daily fantasy sports, especially baseball. You could spend hours each day curating all of the content and statistical information you find in our DraftKings baseball cheat sheets, from hitting statistics like wOBA, WRC+ and ISO to pitching stats including K%, opposing hitter numbers and more. Wouldn't you rather have a team of experts collecting and disseminating all of this data for you, rather than hunting it all down yourself via Google and complicated statistics sites? You would and that's exactly why we've done it all for you. We pride ourselves in providing a great user experience in everything we do at Daily Fantasy Cafe and that goes for our Cheat Sheets as well. We could throw a ton of numbers at you and act like we're providing a service, but we want to do much more than that. Our cheat sheets are designed with the users' needs in mind, which is why we make them easy to read and provide you with only the statistics that will be helpful to you that day. This cuts down on the unnecessary clutter that can distract you from the information that you need to find and read to build a successful DraftKings lineup. Saving you time and providing a good experience is nice, but everyone wants to win. Our specialized cheat sheets provide you with valuable information on how to win that night, not in the long run or over time, but the exact day you are using them. Many see baseball as a tough sport to win because the best players are so good, but we're providing you with the information that the best players are using to make their lineups. Putting out a competitive team each and every day is the most important thing as a daily fantasy baseball player and the content and data we provide in our cheat sheets allow you to do just that in a fraction of the time it would take to do it on your own. 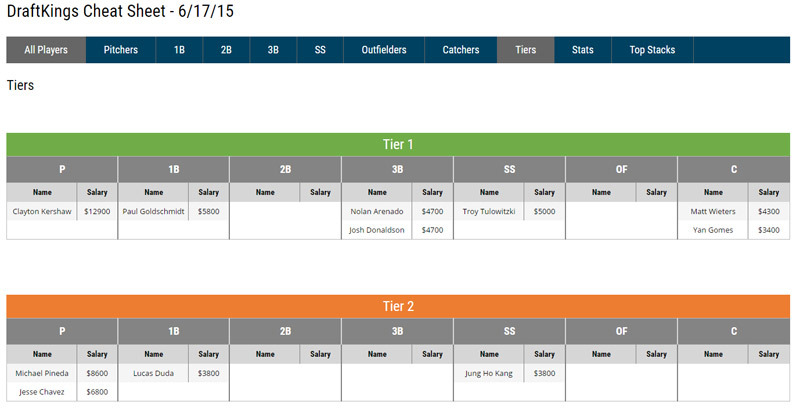 Why Daily Fantasy Cafe DraftKings MLB Cheat Sheets? The MLB Experts at Daily Fantasy Cafe have been the most accurate over the past four seasons according to FantasyPros. Our experts have combined to win hundreds of thousands of games and millions of dollars in DraftKings contests. Our user experience is second to none. DFC has the most accurate Daily Fantasy Baseball experts. What's in the Cheat Sheets? We offer a quick breakdown of all the players in the cheat sheet. Listing their matchups for the day, salary, projected points, Vegas totals and more. We even break down what the best type of game to play each player in, while offering quick tips that let you rapidly see a few reasons why we like each player that day. Once you start to find some players you like, we offer individual player analysis by one of our experts on each player listed, explaining how some of information we've provided makes that player a great play on the day's slate and what game type they are best suited for. You'll get an inside look at our experts' thoughts on each player we are considering for the day, to give you some food for thought as you're constructing lineups of your own. We then break down the players listed into daily tiers, so you can more easily differentiate between players grouped together and not, so you can quickly reference how much of an upgrade or downgrade and player-for-player swap will be in your lineups. Tiers are absolutely essential for building teams on the go or in a short amount of time, especially in baseball when day-to-day variance can lead to many players being projected around the same totals, yet their results with differ drastically. We provide you with advanced statistics for each of the players listed in our sheets. These aren't just bulk statistics you can find anywhere and we don't just list every statistic we can find. These are carefully curated to be useful for that day, and that day alone. No more sifting through spreadsheets and charts full of stats you don't need just to find the one you do. Get all of the daily statistics you need and only the ones you need with our cheat sheets. Lastly, we provide our Top Stacks of the day. These stacks include the Top Stack, Value Stack and Contrarian Stack to give you all the statistics, analysis and guidance needed to win more money. OPS - On-base Plus Slugging is exactly what it sounds like: the sum of a player's on-base percentage and their slugging percentage. wOBA - Weighted on-base average is a statistic, based on linear weights, designed to measure a player's overall offensive contributions per plate appearance. wRC+ - Weighted Runs Created is an improved version of Bill James' Runs Created (RC) statistic, which attempted to quantify a player's total offensive value and measure it by runs. Weighted Runs Created Plus measures how a player's wRC compares with league average after controlling for park effects. ISO - Isolated Power is a measure of a hitter's raw power and tells you how often a player hits for extra bases. We know that not all hits are created equally and ISO provides you with a quick tool for determining the degree to which a given hitter provides extra base hits as opposed to singles. Pitcher K% - Strikeout percentage measures how often a pitcher strikes out the batters he faces on a per plate appearance basis. This often tells you whether a pitcher is pitching to contact or has the talent necessary for high strikeout totals. Pitcher BB% - Walk percentage measures how often a pitcher walks the batters he faces on a per plate appearance basis. This is a generally a measure of control. The pitchers with the best control tend to put themselves in better position to succeed on a per-at bat basis. Opponent Team Stats - These are many of the same stats we provide for hitters, but for the pitchers, we provide them as the opposing team total. As mentioned above, this is a weighted on-base average, isolated power, etc. We take this for opposing teams against the handedness of the pitcher, so you have a knowledge of how the team will perform against that pitcher on the given day.